Use an Excel filter to show only the rows that match a value or meet a condition. Rows that do not match the condition are hidden temporarily, and subsequent data analysis excludes them. This feature is extremely useful when you want to see how the analysis changes for a different subset of the data. Note: Prior to version 5.10 the active filter is not saved with the analysis. When you recalculate an analysis the rows currently visible are analyzed, regardless of the filter you used when creating the analysis. From version 5.10 onwards, by default the filter criteria are saved with the analysis and re-applied when you recalculate or make other changes to the analysis. The drop-down arrow next to the Filter command on the ribbon of the active analysis lets you change between Use active filter which always uses the currently active filter when recalculating (pre version 5.10 behavior) and Save Filter & Re-apply (version 5.10 or later behavior) which saves the filter when the analysis is calculated and re-applies it on subsequent recalculation. On the Analyse-it ribbon tab, click Filter to show filter icons on the active dataset. If you are on an analysis report, the saved filter (if any) will be applied to the dataset. You can modify the filter and return to the analysis and click Recalcuate to apply the new filter, or you can start a new analysis to reuse the filter criteria. 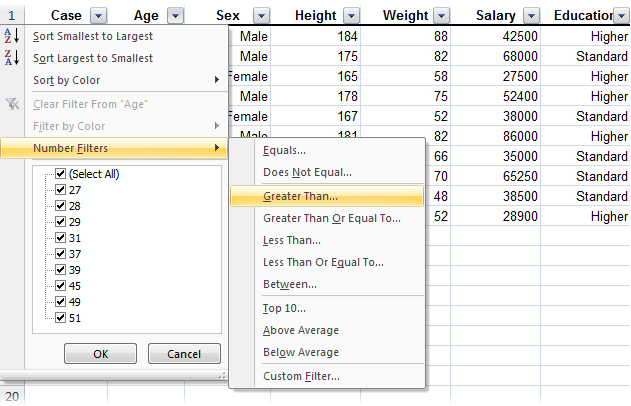 Click the drop-down button alongside a variable, and then either select the values to match, or apply other criteria. The save filter feature in version 5.10 or later works with almost all filter conditions: filter by value, by condition, by color/fill/icon, above/below average, top/bottom items, and so on. There is one limitation: filtering to multiple dates. 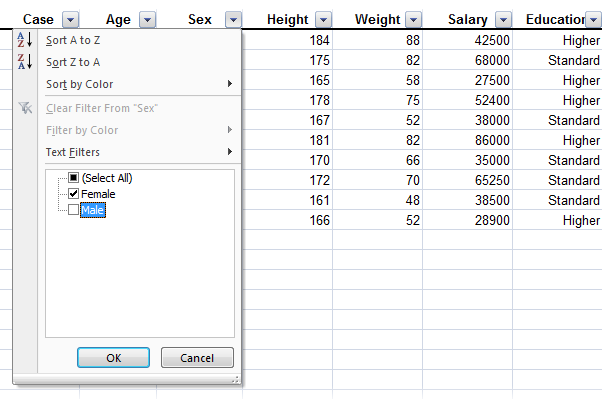 If you filter to more than 2 dates, add-ins such as Analyse-it cannot retrieve the list of values to filter to. This is a limitation of Microsoft Excel and unfortunately it hasn’t been remedied in the last few years so it is low on Microsoft’s priorities. If this is seriously affecting you, please get in touch with Microsoft and ask them to resolve this limitation for add-in developers. Create or recalculate an analysis to see the effect of the filter.